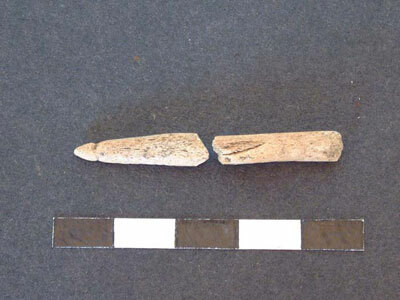 New Finds from the High Pasture Cave site…..
At least twenty antler and bone objects have been identified from the High Pasture Cave excavations in Trench 1, Bone Passage. Fifteen of these have been worked and include bone points and perforated bone antler plates with good Iron Age parallels. 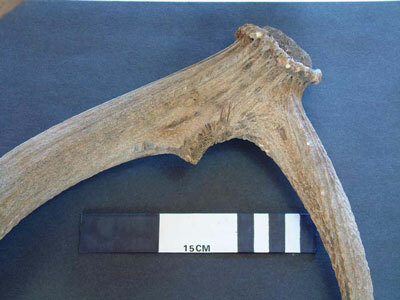 Evidence for the working of antler is indicated from the raw material, which generally comprises red deer antler, through to the finished items - many of hich have been used. Such an assemblage of objects are of significant interest and merit full study and publication. We are fortunate with the High Pasture Cave site in that the environmental conditions within the cave are ideal for the preservation of organic materials. This is unusual in contexts in Skye and the surrounding region, because the more usual acidic soils quickly degrade these materials, leaving little trace in the archaeological record. The images below show a range of items recovered from Trench 1. 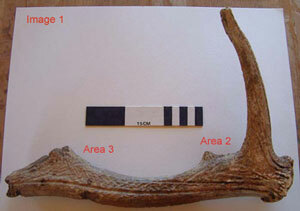 Image 1 above shows a possible red deer antler pick, although this may be a antler from which raw material has been extracted (see Area 2 and 3 below). The image above shows Area 2 where a tine has been detached from the antler. Cut marks can be seen to one side of the detachment. 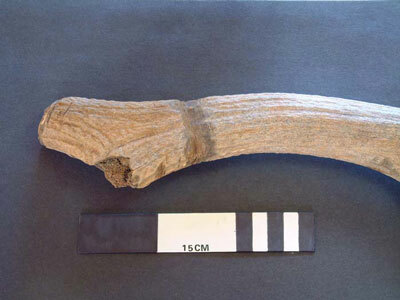 Area 3, shown below, clearly reveals some form of grooving on the antler beam - possibly the first stage in the division of a piece of material from the antler. Cut marks made by a metal blade also indicate where sections of the antler have been detached to the left of the grooved area. 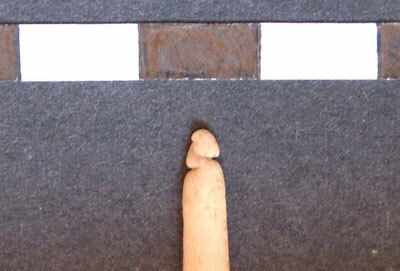 The point shown below is a very basic tool made on a fragment of animal bone and has seen little use. Used as a awl or piecer, this expedient form of tool could have been used on a variety of tasks at the site. Some Iron Age sites produce significant numbers of these tools, so we shall keep our eyes peeled during the excavations in 2005. 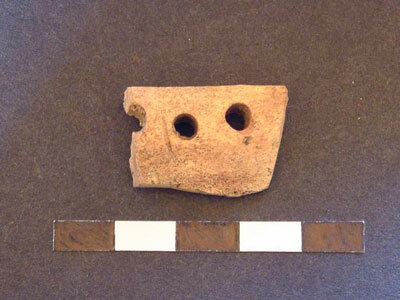 The image below shows a fragment of antler comprising a plate that has holes bored through it. These small finds often emerge from the sediments during sieving at the surface and we soon found another of the antler plates complete with in-situ bone pegs. 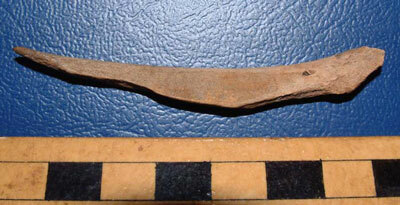 At first we thought this may be some form of bone knife handle, or the side-plate from a composite comb. However, some pegs also started to appear in the sieve that fit the size of hole in the plates. The length of these precludes their use as suggested above and it has now been suggested that they may be some form of decorative embellishment, possibly used on a wooden item (hence the fairly long, tapered bone pins). The plate with a selection of the bone pins recovered during sieving operations at the High Pastures site. Similar items have been recovered from Iron Age sites in Orkney (Broch of Burrian) and in the Outer Hebrides (Dun Foshigarry). Another extemely small find of bone is shown above (just under 3cm long). With areas of weak polish at both ends of the artefact we thought this may be some form of fish gorge. However, it is more likely to be another type of bone point, of unknown function - any ideas? Another unusual bone item is shown above. At first we thought that this was some form of dress pin, with the carving at one end quite suggestive of a face? See below. However, it seems this item may have been used to work with thread in some way, the ‘carved head’ merely a result of the action of the thread on the bone. A second bone tool of similar form was also recovered from Trench 1, although this one was not so well preserved (see below). We certainly expect to find more items manufactured from antler and bone during the 2005 fieldwork season, so watch this space. 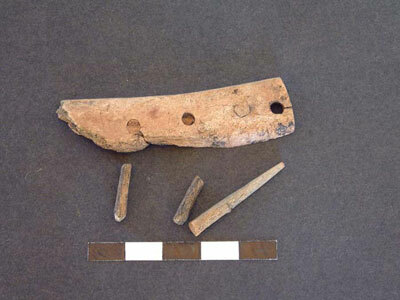 Previous entry: Evidence for metalworking from Trench 1, Bone Passage - July 2004. The plates with holes and attendant pins might conceivably be wrest plates with tuning pegs for a stringed musical instrument. Any attendant thin decorative metal could have been used to embellish such an instrument.